Roasted turkey, ham, bacon, lettuce, tomatoes and salad dressing stacked high on three slices of white toast. Grilled lamb slices served on warm pita bread with a cool cucumber dressing. Topped with tomatoes and white onions. A juicy burger on thick sliced light rye bread. Topped with sautéed onions, olives, melted Swiss cheese and Thousand Island dressing. 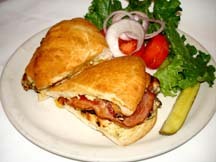 Two tender boneless grilled chicken breasts with colby cheese, bacon, lettuce and tomatoes. Served on grilled ciabatta bread with pesto mayonnaise. Grilled marinated strips of chicken breast wrapped in a large tortilla with tomatoes, romaine lettuce and our famous fiesta ranch sauce. A fillet of Cod, battered and fried topped with tartar sauce, lettuce and tomato. Lean corned beef and sauerkraut on thick sliced light rye bread with Swiss cheese and Thousand Island dressing. Sliced turkey breast and coleslaw served on light rye bread topped with Thousand Island Dressing and Swiss Cheese. Tender chicken breast, breaded and fried served with lettuce, tomato and salad dressing. Our take on an old classic. You'll love it! Our 1/2 lb. thick, juicy, all beef burgers are grilled over an open flame. Served on a toasted bun with lettuce, tomatoes, onions and a pickle spear. 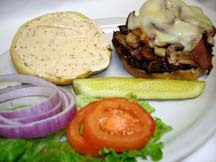 Our classic burger topped with your choice of sautéed mushrooms and Swiss OR green olives and Swiss. Add two slices of your favorite cheese for 50¢ Swiss, Mozzarella or Cheddar. Our 1/2 lb burger topped with our special bruschetta mix, mozzarella cheese and pesto mayo. Mushrooms sautéed in a red wine and garlic sauce, topped with bacon, Swiss and homemade Cajun spread. 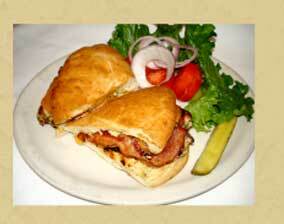 All our food is prepared fresh daily for that great homemade flavor. We pile on the pepperoni, ham, Italian sausage, onions, mushrooms, mozzarella cheese and pizza sauce on this fabulous sub. Do you like pizza with everything? We pile on the pepperoni, ham, Italian sausage, onions, mushrooms, mozzarella cheese and pizza sauce on this fabulous anionic. Thinly sliced ham smothered with mozzarella cheese. Served with lettuce and salad dressing. Our homemade meatballs smothered in meat sauce and topped with mozzarella cheese. A large patty of our homemade Italian sausage topped with mozzarella cheese and meat sauce. Tender sliced turkey with mozzarella cheese, crisp lettuce, plump tomatoes and salad dressing. Pepperoni, ham, mozzarella cheese, crisp lettuce and salad dressing make this one the coach's favorite. Garden fresh tomatoes, onions, green peppers, mushrooms, green olives, mozzarella cheese, lettuce and salad dressing. Pepperoni, ham, capicola, mozzarella cheese, onions and mushrooms. Topped with lettuce, tomatoes and dressing. (c) Uccello's Wayland/Uccello'sway.com all rights reserved.